Interestingly, Putin's first decree was to guarantee Yeltsin and his family that they would not be prosecuted on corruption charges. 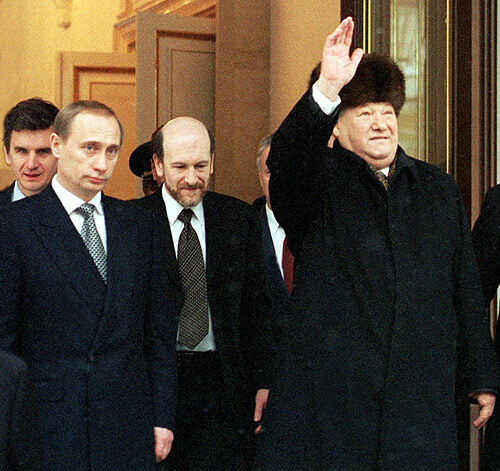 On this day in 1999, Boris Yeltsin resigned, making prime minister Vladimir Putin the acting President of Russia. Interestingly, Putin’s first decree was to guarantee Yeltsin and his family that they would not be prosecuted on corruption charges. A few months later, in 2000, Putin won the presidential elections and thus became the the President of the Russian Federation. Putin was born in Leningrad (now St. Petersburg) in 1952. His grandfather Spiridon Ivanovich Putin once worked as Lenin’s and Stalin’s cook. Vladimir Putin studied international law, and then found employment with the KGB. As a member of the KGB, he was stationed in East Germany from 1985 until 1990, mostly in the city of Dresden, where one of his daughters was born. Putin’s rise in politics began after he returned to his native Russia after the fall of communism in Eastern Germany in 1990. Ten years later, he became the President of the Russian Federation, after Yeltsin’s mentioned resignation.